Keep in mind that the maximum speeds specified in 14 CFR Part 91, § 91.117 still apply during speed adjustments. It is the pilot’s responsibility to advise ATC if an assigned speed adjustment would cause an exceedence of these limits. For operations in Class C or D airspace at or below 2,500 feet above ground level (AGL), within 4 NM of the primary airport, ATC has the authority to approve a faster speed than those prescribed in 14 CFR Part 91, § 91.117. Pilots operating at or above 10,000 feet MSL on an assigned speed adjustment that is greater than 250 KIAS are expected to reduce speed to 250 KIAS to comply with 14 CFR Part 91, § 91.117(a) when cleared below 10,000 feet MSL, within domestic airspace. This speed adjustment is made without notifying ATC. Pilots are expected to comply with the other provisions of 14 CFR Part 91, § 91.117 without notifying ATC. For example, it is normal for faster aircraft to level off at 10,000 feet MSL while slowing to the 250 KIAS limit that applies below that altitude, and to level off at 2,500 feet above airport elevation to slow to the 200 KIAS limit that applies within the surface limits of Class C or D airspace. Controllers anticipate this action and plan accordingly. Speed restrictions of 250 knots do not apply to aircraft operating beyond 12 NM from the coastline within the United States Flight Information Region in offshore Class E airspace below 10,000 feet MSL. In airspace underlying a Class B airspace area designated for an airport, pilots are expected to comply with the 200 KIAS limit specified in 14 CFR Part 91, § 91.117(c). (See 14 CFR Part 91, § 91.117(c) and 91.703.) Approach clearances cancel any previously assigned speed adjustment. If aircraft reach a clearance limit before receiving a further clearance from ATC, a holding pattern is required at the last assigned altitude. Controllers assign holds for a variety of reasons, including deteriorating weather or high traffic volume. Holding might also be required following a missed approach. Since flying outside the area set aside for a holding pattern could lead to an encounter with terrain or other aircraft, aircrews need to understand the size of the protected airspace that a holding pattern provides. Each holding pattern has a fix, a direction to hold from the fix, and an airway, bearing, course, radial, or route on which the aircraft is to hold. These elements, along with the direction of the turns, define the holding pattern. Since the speed of the aircraft affects the size of a holding pattern, maximum holding airspeeds have been designated to limit the amount of airspace that must be protected. The three airspeed limits are shown in Figure 2-73 in below. Some holding patterns have additional airspeed restrictions to keep faster aircraft from flying out of the protected area. These are depicted on charts by using an icon and the limiting airspeed. Figure 2-73. 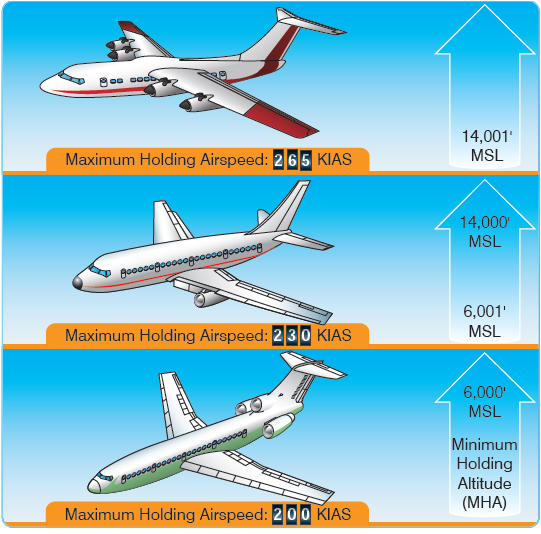 Maximum holding speeds for different altitudes. DME and IFR-certified GPS equipment offer some additional options for holding. Rather than being based on time, the leg lengths for DME/GPS holding patterns are based on distances in nautical miles. These patterns use the same entry and holding procedures as conventional holding patterns. The controller or the instrument approach procedure chart specifies the length of the outbound leg. The end of the outbound leg is determined by the DME or the along track distance (ATD) readout. The holding fix on conventional procedures, or controller-defined holding based on a conventional navigation aid with DME, is a specified course or radial and distances are from the DME station for both the inbound and outbound ends of the holding pattern. When flying published GPS overlay or standalone procedures with distance specified, the holding fix is a waypoint in the database and the end of the outbound leg is determined by the ATD. Instead of using the end of the outbound leg, some FMS are programmed to cue the inbound turn so that the inbound leg length matches the charted outbound leg length. If ATC wants to restrict the pilot to a specific approach, the controller names the approach in the clearance. For example, “…cleared ILS Runway 35 Right approach.” When the landing is to be made on a runway that is not aligned with the approach being flown, the controller may issue a circling approach clearance, such as “…cleared for VOR Runway 17 approach, circle to land Runway 23.” Approaches whose final approach segment is more than 30 degrees different from the landing runway alignment are always designated as circling approaches. Unless a specific landing runway is specified in the approach clearance, the pilot may land on any runway. Pilots landing at non-towered airports are reminded of the importance of making radio calls as set forth in the AIM. When cleared for an approach prior to reaching a holding fix, ATC expects the pilot to continue to the holding fix, along the feeder route associated with the fix, and then to the IAF. If a feeder route to an IAF begins at a fix located along the route of flight prior to reaching the holding fix, and clearance for an approach is issued, the pilot should commence the approach via the published feeder route. The pilot is expected to commence the approach in a similar manner at the IAF, if the IAF is located along the route to the holding fix. ATC also may clear an aircraft directly to the IAF by using language such as “direct” or “proceed direct.” Controllers normally identify an approach by its published name, even if some component of the approach aid (such as the glideslope of an ILS) is inoperative or unreliable. The controller uses the name of the approach as published but advises the aircraft when issuing the approach clearance that the component is unusable.